Sharing my joy of two passions I have: agriculture and people. This is the diary of a farmgirl who works in the city. My experiences at farmer's markets will hopefully inform, educate, and bring a smile to your face! Hello all! Sorry I haven't blogged in a while. School sure does it get crazy. I thought I'd take this opportunity to share with you some of my experiences visiting San Francisco lately. Just last weekend, while visiting my best friend in Frisco (who is also a fellow foodie), many of our expeditions involved, well, food! We ate some wonderful fare at restaurants such as Perry's in the Financial/Soma district and Mamacita's in the Marina District. We also browsed in one of my favorite places ever, the Ferry Building Plaza Marketplace, chock-full of local produce, artisan foods, and tons of gourmet goodies. 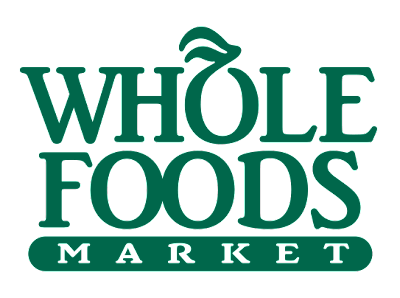 We also took a visit to Whole Foods, and I was impressed to notice their commitment to bringing fresh and local food to their customers. In fact, for many products, they provide a brief description of who the producer/farmer of the product is, where they're from, and what their practices include. Being the fruit girl aggie that I am, I couldn't help but look at all of the labels for everything to see their country of origin. As we approached the nuts & dried fruit aisle, I was checking out their different almond flavors & mixes. In particular, I was impressed by Whole Foods' own line of products. I picked up a container of their brand of raw almonds and noticed that their appearance was just a little different than the nonpariel variety that we grow that I was used to seeing. 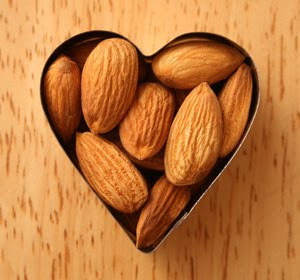 1) California produces 80% of the world's almonds, and nearly 100% of the U.S. commercial supply. That being said, there is definitely not a shortage of California almonds. 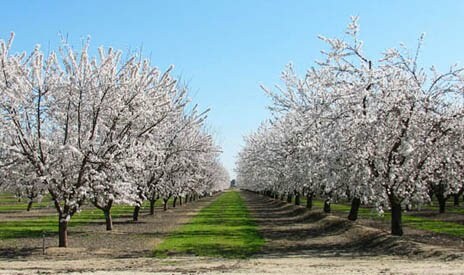 Almond orchard in bloom in Turlock, California. 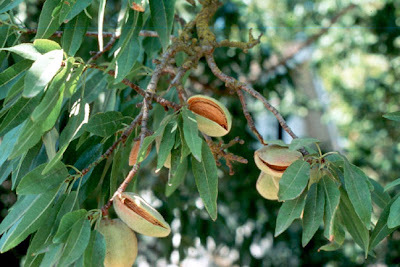 Almonds typically bloom between February 23rd and March 9th. 2) These particular almonds were labelled "raw". In 2007, the almond pasteurization program became mandatory for the California industry, so even though California almonds are labelled "raw", we can be sure that they have been either steam-pasteurized OR treated with propylene oxide. This law, however, does NOT apply to imported almonds. Overall, researchers have determined that pasteurization allows for an overall better product, one that was cleaner and had a potentially longer shelf life, and did not compromise other desired qualities in the nuts such as taste, texture, and chemical composition. 3) These particular almonds were also organic, so one can make the argument that perhaps there is not a large enough organic almond supply here in California to meet the demand. 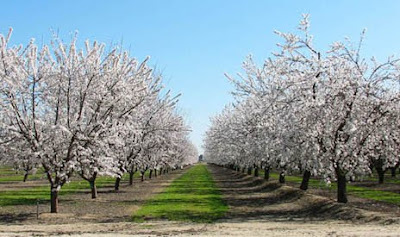 Although the organic almond acreage is small when compared to the overall almond production (between 1-2%), there are co-ops such as Big Tree Organic Farms located in Turlock, California that provide organic almonds to many customers. Big Tree is an example of a locally owned company that is committed to providing an excellent product that is high-quality. Perhaps Whole Foods has an imported raw almond product because they fear that pasteurization requirements has caused consumers who demand organic to object to any kind of treatment. Because imported almonds do not need to be pasteurized, distributors such as Whole Foods may be turning to organic almonds from Spain, Uzbekistan, Iran, Italy, and other countries. to NOT provide a local, California-grown, high-quality, raw product that is grown in abundance (literally) right down the road. And what if we still have not sold it all? At almost every market, we donate our a large amound of out unsold produce to organizations who feed the homeless and hungry. Here is some information of some of the wonderful organizations out there that are helping those in need. Please make sure to check out their websites! So the melon patch is ready at Cipponeri Family Farms! Melons are a delicious treat and contrary to popular belief, they are actually a vegetable! HOWEVER; due to their sweet characteristics, they are marketed as a fruit crop. Along with their relatives cucumbers and squash, they are in the Cucurbitaceae family. Here is a photo of some of our melons we took to market last week; from left to right: Sharlyn, Orange flesh honeydew, and Canary. Cipponeri Family Farms specializes in growing a few main types of specialty melons. Below is some information to find the best melon for your liking! This is a round melon that has a netted outside skin, similar to a cantaloupe, and a pale orange to cream colored flesh inside that provides a flavor similar to a combination of a honeydew and a cantaloupe. As the fruit ripens, the outer flesh turns from a greenish color surrounded by the tan netted lines to an orange tone with tan lines.. The Sharlyn melon cannot be kept for more than several days, as it is very perishable when it is ripe. This is my personal favorite! When ripe, these melons will turn a creamy yellow color with a slight orange tinge. They will be firm with a small amount of softness at the stem. Sometimes, the seeds of an especially juicy melon will rattle if the melon is shaken. They are a a hybrid between cantaloupes and honeydews and appropriately, look like a regular green honeydew on the outside but resemble a cantaloupe on the inside. The Canary melon is a large, bright-yellow melon with a pale green to white inner flesh. This melon has a distinctively sweet flavor that is slightly more tangy than a honeydew melon. The flesh looks like that of a pear but is softer and tastes similar to a cantaloupe. When ripe, the rind attains a golden tint and its flesh will have a pink tinge around its seed cavity. This melon is often marketed as the Juan Canary melon and got its name after the Canary Islands where they were first popularized. This is an oval-shaped summer melon with a golden-yellow rind. The rind will turn a more yellow-gold tint as it ripens. It's a blend of the Persian and Casaba melon. They have a very interesting sweet and spicy taste. It has a very aromatic and sweet flesh. This melon is round/oval with yellow-orange skin that is green at the ends. The flesh is a creamy-white color. When ripe, it's pale-yellow. It is sweet but has a more mellow flavor than the rest of the melons. Unlike most melons, it does not have an aroma when ripe. Most melons will have a sweet aroma when ripe. All of our melons at CFF are picked ripe and ready to eat, so one really cannot go wrong when selecting one from our stall. All melons (except Canary) can have a little bit of give (softness) at the stem ends when ripe for optimum sweetness. Hello all! Sorry I have not blogged for a while! I wanted to prepare an awesome post about where the magic happens - the farm of course! Enjoy these pictures of life at the ranch! After a day in the city, I just love coming home to the farm and seeing where it all begins: the orchards! My co-worker Marissa & I with the Bings. Topping the cherry trees: this is done after the season is just about over with. Squash patch. Squash will be ready in our region starting in August! Split pit in a white nectarine. DON'T EAT THESE! Read my post titled "A Little Bit of Stone Fruit 101!" to find out more info on this! On average, I have approximately 25 customers per day ask me the pivotal question: “Is your fruit organic?” What a great question. I always thank customers for asking this because it is important for the consumer to know what they’re buying. Even though our produce is all conventionally grown (i.e. NOT organic), we use a lot of practices that organic growers use. For example, we typically only spray when we have to (this past year, we did not have to spray at any time other than the dormant season; dormancy is when there are no fruit on the trees and for stone fruits it is the winter time), and all of the sprays we use are actually sprays used by organic farmers OR that are currently on the list to be organic-approved. The major difference between our produce and organically-grown produce? Not much. In fact, you will not find ANY spray residue on our fruit whatsoever. What the general public does not really understand is that Certified Organic is a title that is purchased. Among other requirements, a farmer must follow a set of guidelines, fill-out tedious paperwork, and of course; dish out money (on top of all of the other costs farmers have) to have their land regulated in order to be a certified organic farmer. Worth it? Perhaps. Nevertheless, in my experience, I have found that a grower can be very sustainable but NOT be organic. Sustainability not only includes growing practices, but also labor and economics. What if a grower is certified organic but does not have proper hydration stations for their workers or isn’t utilizing their water supply efficiently? So does “sustainable” always mean “organic”? No. Contrary to popular belief though, “organic” does NOT always mean “sustainable”, either. I think that organic produce is fabulous. If a grower has the means to be certified organic, I think he should go for it. However, I think that there is more than just a yes or no answer when the question is, “Is your fruit organic?” It absolutely baffles me when customers ask that question and immediately walk away when I say “no” – as I am thinking to myself, ‘but you didn’t let me finish!’ If customers had a better understanding of what organic actually is, I think 95% of the customers who are die-hard organic fans would feel confident in purchasing my fruit. I once had a customer ask me whether or not our fruit is organic, and after I explained our growing practices, she looked me with the most puzzled look on her face and asked, “Sooooooo…is it bad for the environment?” The key here is EDUCATION. This is evidence that the average American consumer is not well-aware about what it is that American producers of foods and fibers (which by the way; only makes of 2% of the nation’s population) actually do. This is part of the reason why I started this blog, to help others understand and to share the story of American agriculturalists! I wanted to share various photos of the past few weeks of my customers and life at the markets as well as a video. Enjoy! All loaded up & ready to roll out after the Concord market. Notice the giant coffee on the truck bed. Going to need that for the ride home! Our display at Civic Center, SF. One of my customers sampling the dried fruits & nuts. The Civic market with City Hall in the background. They were playing the USA game on a big screen when they played Algeria in the World Cup! We could hear the roar when Donovan scored! Amazing! The market is such a little subculture. These are my "market parents" Dave & Lori. They are from Modesto and sell organic, cage-free eggs. I met them 4 years ago when I started working. They really watch out for me (Civic is a crazy place!) and are there for whatever we need. This is Yarone and his adorable son Cruve. They have been customers of ours for 2-3 years. It has been really neat because I have got to witness Cruve grow up throughout that time. He loves fruit and can name any fruit/vegetable you put in front of him! Tying down the trailer before leaving the market. One of our customers pondering a cherry purchase. After trying a sample I am sure she bought! Only in SF do you wear a scarf & jacket in the middle of June! Mark Twain once wrote, “The coldest winter I ever spent was a summer in San Francisco.” The man was right! My co-worker Katrina handing out apricot samples to customers. She is dancing to try and keep warm! I call her "Maganda", which is Filipino for "beautiful lady". Unloading back at the farm. Driving home from market. A truck with no AC makes things interesting! Good morning San Francisco! Driving over the bay bridge at 5am! I miei cugini! My cousins came to work with me, so fun! This is one of my loyal customers at Crocker Galleria, Kathy. She buys my overripe fruit and makes jams & jellies with them. Just last year, her jam made with our yellow peaches won 1st place at the Eat Real Festival put on by Slow Food Nation at Jack London Square in Oakland! I need this shirt! My friend who sells eggs at Half Moon Bay got this at the Farm Aid concert! Yo e mi amigo Santiago. I have known him for about 4 years. He is so happy & friendly and is famous at the market! A mural at the Portuguese hall in Half Moon Bay! I am going to stop there after work from now on to get a linquica sandwich! Saw this at Starbucks and had to take a picture! This is my friend Larry who sells at the organic vegetable stand across the way from me at Civic Center. I found a picture of him in an agriculture publication called California Country magazine. I brought it to him and he had no idea he was in it but was so happy to receive it! Handing out yellow peach samples at Civic Center. "Peaches SO sweet, they might make you want to SLAP somebody - so be careful!" Time to go home from Civic Center, finally! San Francisco is such a beautiful city! Getting the display out is key in setting up. A pretty display catches the consumer's eye and draws them in to sample our delicious fruit! This reminds of my the crazy aunt when she talks about her growth in My Big Fat Greek Wedding: "....it was my twin!" These pluots and yellow peach are attached to their "double" which is probably due to the abundant rain this past spring. The attached ovary does not usually develop as fully. These would never be found in the grocery store as they would be culled in processing. Since our fruit is picked and immediately taken to market, we get to see fun stuff like this! My friend Mike from Half Moon Bay has a dahlia farm and brings me a bunch in exchange for some fruit. These dahlias are some of the most beautiful flowers I have ever seen! Hello there! Thanks for reading my blog! My name is Brean and I am student at California Polytechnic State University (Cal Poly) in San Luis Obispo, California. I am a fruit science major with a minor in agricultural communications. For the past four years, I have worked for a family friend who is a farmer, growing stone fruits, nuts, and vegetables in Turlock, my hometown. My blog is a collection of photos and stories to share my joy of two passions I have: agriculture and people. This is the diary of a farmgirl who works in the city. My experiences at farmer's markets will hopefully inform, educate, and bring a smile to your face!